Greenhouse Inner shading and ventilation curtain white color for iran market. Main Technology: Heat treatment, Shrinkage rate less than1.5%, Strengthen technology in closed weave, Enhanced composite non aluminum stain. Main Material:	Pet film, Pe film, Pet yarn. Addictive:	UV. Drip proof stabilizer, Light stabilizer. Width of Screen:	General Width, 3.2M, 3.5M, 4.3M, 4.8M, 5.3M. Widest 5.5M, other width can be jointed by two pieces or mass production. 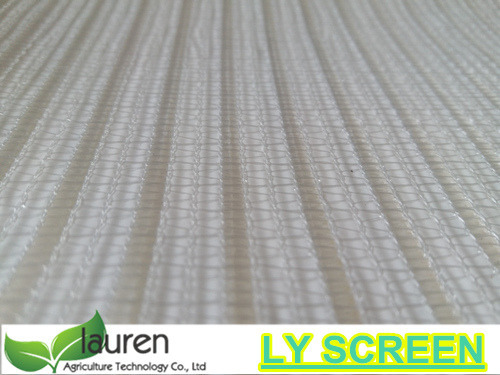 Length of Screen:	According to customer’s request, general width is 70M/Roll, 100M/roll, 200M/Roll, 210M/Roll. Function:	Sunshine shading; energy saving; sunshine ratio controlled. We are the earliest Greenhouse Climate Shade Screen factory in CHINA.